The Centre for Innovation and Connected Learning has been talked up for months now as the project that will make Brampton a stop on the so-called “Innovation Corridor” between Toronto and Kitchener-Waterloo. The city is prepared to take on about $50 million in debt, which was reduced from $80 million by redirecting funds from the federal gas tax grant, in order to fund the $100 million project. But those amounts could change, depending on future funding opportunities for the centre. Following the sudden cancellation of the province’s $90 million funding commitment for a downtown Ryerson University campus, the central feature of the planned Brampton post-secondary expansion which Ryerson was forced to pull out of because of Queen’s Park’s shocking move, the city is now playing a bit of a shell game with taxpayer dollars after the previous city council under former mayor Linda Jeffrey pledged $150 million, $50 million for the campus and $100 million for the innovation centre. The cybersecure catalyst is part of a nationally integrated network of cybersecurity training measures being spearheaded in the region by Ryerson. It seems, at first, that Ryerson’s precarious presence in the city, after Doug Ford’s PC government reneged on the $90 million of funding, is transitioning from the original vision of a full-blown satellite campus that would have hosted thousands of students at the proposed downtown site for the campus plan. 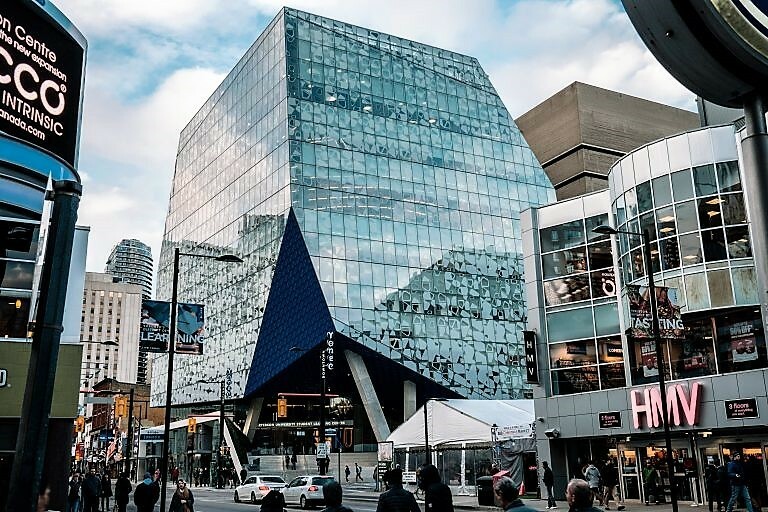 Ryerson was forced to withdraw from that project after the funding cut, and has moved to a smaller role as an incubator of economic activity in the city. But what do residents really know about this taxpayer-funded centre for innovation facility being touted as a major benefit for the city? While the exact financing remains unclear, the location of the planned building is pretty well established. Properties at 14 and 21 Nelson St., near the Brampton GO station, have been chosen as the site for the joint-use facility. But beyond the debt funding, which will be paid back over 30 years, and the location, there don’t appear to be any specific details available about what activity will take place in the space or what exactly the Centre for Innovation even is. The Centre for Innovation on Nelson Street. An Innovation Hub inside the City Hall West Tower. A Cybersecure Catalyst program with Ryerson University. 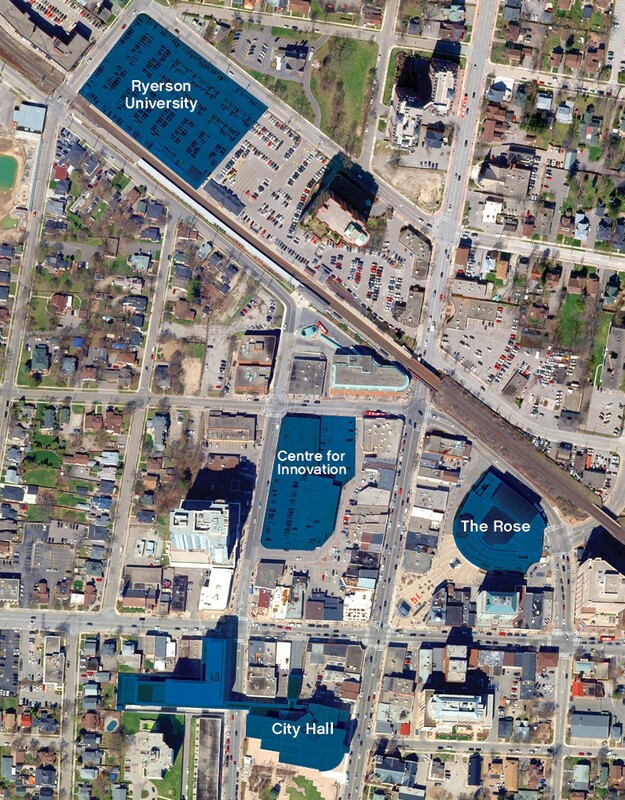 With the uncertainty surrounding the entire future of the original plan, after the loss of $90 million promised by the province, the innovation centre’s program and benefits remain unclear. The city so far seems to be taking an “if you build it, they will come” approach, despite approving tens of millions of dollars in the budget that taxpayers will have to fund through debt payments. “It is still too early in the process to speak to any of these questions,” Ryerson’s manager of public affairs, Johanna VanderMaas, told The Pointer in an emailed response Tuesday, when asked for details about the project including its scope, potential partnerships, work that will be done at the facility and benefits for the city and students. The City of Brampton provided slightly more information but also made it clear there hasn’t been much movement since the initial request for proposals for the design and construction. “The City received 18 submissions in response to a request for pre-qualification for design services for the Centre — a joint-use facility… ,” said city spokesperson Natalie Stogdill on Monday. However, according to Stogdill’s response, those submissions were apparently received prior to the dramatic change in plans forced by the cancellation of provincial funding. Not to be confused with the Innovation Centre, the Innovation Hub will be located at 41 George St. where the nine-storey City Hall West Tower stands and will be a “pilot incubator space (a final name for this space is TBA)... . This incubator space will be led by Ryerson in partnership with the City of Brampton,” Stogdill said. Ryerson's Brampton location of the Chang School of Continuing Education, with 60 students, opened in January, using space in the West Tower as well. When the controversial $205 million City Hall expansion was launched in 2009 to build the West Tower, the plan detailed in the RFP for the project stated the city needed “Administrative Space requirements of 126,000 square feet” to house the growing number of city staff. The winning bid detailed that the West Tower would be built for the “expansion of City Hall offices, 126,398 sq. feet”. When city council and former mayor Susan Fennell pushed for the West Tower to be built because of the lack of space to house city staff, there was no mention that the $205 million taxpayer-funded building might possibly house an innovation hub or any other collaboration with a university or the private sector. Incubator spaces, like the Digital Media Zone at Ryerson’s Toronto campus, take business pitches from local entrepreneurs and, once approved, provide them with the necessary resources to see their project through. It’s not clear how much of that money, if any, will be coming to the city, as none of it has yet been committed. It’s also unclear, if Ryerson gets some of the funding, how much would be invested in Brampton, as its cybersecure catalyst program has deep ties with its Toronto campus and other stakeholders. A spokesperson for Sahota, responding to questions, added in an email to The Pointer Tuesday that the MP is not sure how much federal funding Ryerson intends to apply for or if any application from Ryerson might also include a funding request for the Centre for Innovation. The process of bringing a university campus to Brampton had been underway for almost six years, yet, this small amount of information—along with a shortlist of architectural firms that might build the Centre for Innovation— constitutes the bulk of available detail on the project. No one seems able to provide a full picture of what this initiative will look like once it is up and running. The province released its Major Capacity Expansion Policy Framework in December 2013, which aimed to bolster space for post-secondary education across the province with the goal of increasing university and college attainment levels from 65 percent to 70 percent. In 2014, Kathleen Wynne’s Liberal government put out a call for proposals for “new or expanded campuses in underserved areas.” Brampton has often been named as the largest city in Canada without a university campus, which could be seen to qualify it as an “underserved” area. “This call for proposals is part of the government's commitment to provide funding for 60,000 additional postsecondary education spaces across Ontario,” said a government release at the time. In 2017, the economic advisory firm urbanMetrics Inc. published an economic impact report quantifying the benefits of a university and its constituent parts coming to Brampton. It spoke of roughly $440 million of gross economic output and 2,125 full-time years of employment. The section on the Centre for Innovation provides a similarly rosy picture. Gross economic output was calculated to be about $240 million and 1,025 full-time employment years. Combined, the two facilities would have netted the local economy about $679 million in output and 3,150 employment years. The perks of a Ryerson presence were beginning to emerge. Residents got a first glimpse of what that presence might look like in April 2018. The city and Ryerson, in partnership with Sheridan College, announced that the campus expansion, innovation centre and Cybersecure Catalyst would be located adjacent to the Brampton GO station. 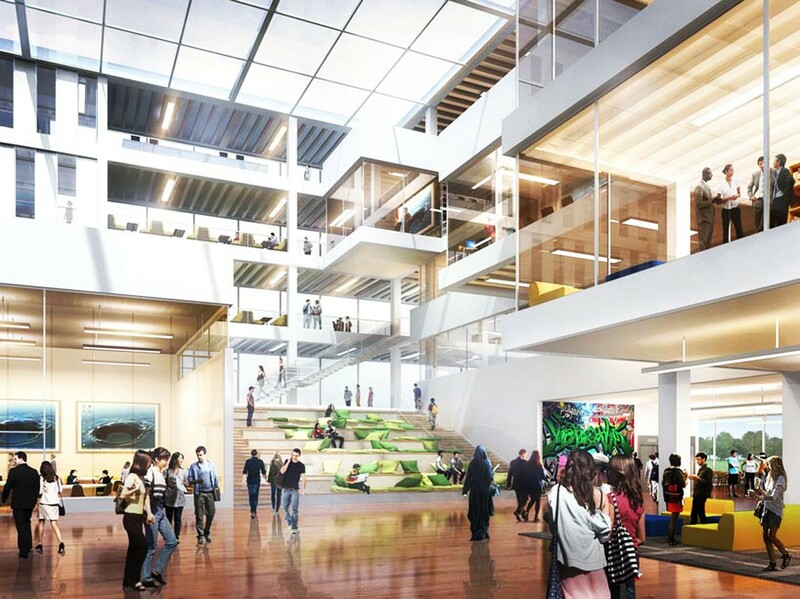 The province committed $90 million to the project, with the city agreeing to put in $50 million towards the campus, with a further $100 million to go to the Centre for Innovation. But all that came to a screeching halt last October, as the new PC government of Doug Ford cancelled the provincial funding, leaving the campus plan in limbo. A major part of the economic output city officials were looking forward to is now gone, and it’s still unknown how its loss will affect the remaining facilities. City and Ryerson officials scrambled to come up with a solution and salvage the work already done. Ryerson Provost Glenn Craney attended a special council meeting the following month and said that the innovation centre, the Cybersecure Catalyst and the now-open 60-student Chang School continuing-education satellite in the City Hall West Tower (referred to as the three pillars) would move ahead, saying the next steps regarding the campus were still being explored. 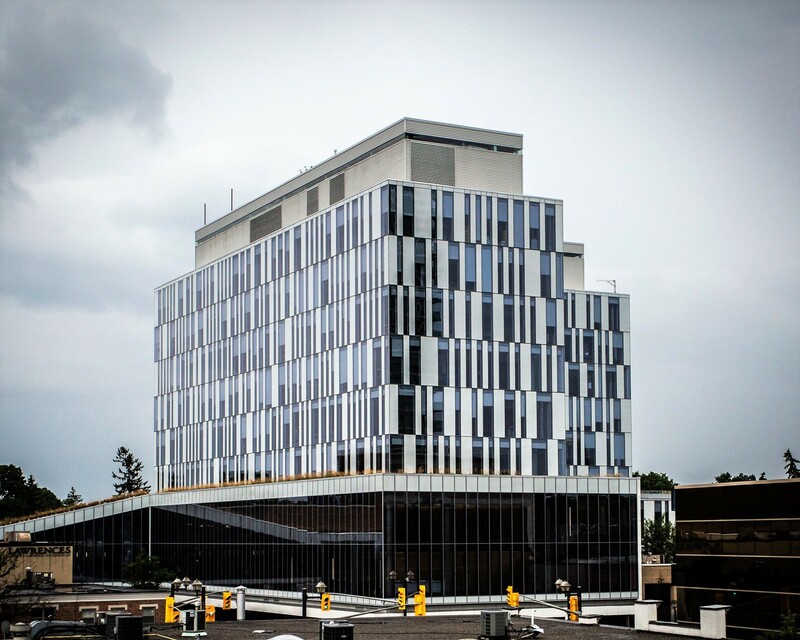 In January this year, as part of a draft terms of reference for the Post-Secondary Education and Innovation Committee, the city reallocated the $150 million in its entirety to the three pillars. Six years of time and effort have been put towards a university presence, and it is still “too early” to say what a vaguely defined Centre for Innovation will do for Brampton.